Today, an entirely new integrated transit system with a new bike-sharing service started in Bordeaux, France. With 1,545 bikes and 139 stations, the new bike-share system is called V³ or Vcub(e) which means Vélos de la Communauté Urbaine de Bordeaux (bikes of the Urban Community of Bordeaux). What sets this new system apart from other 3rd generation bike-sharing services (3rd generation bike-sharing blog post) is that its design and implementation are integral parts of a new transit system for Bordeaux and its environs. Nine out of every 10 stations are at a transit stop. In the city the stations are close together, no more than 300 meters apart. Outside the city there are 40 stations (see the map). There is a new single Radio Frequency Identification (RFID) Bordeaux transit card that's valid throughout the region. It also allows holders of the transit card to use the bikes at a substantially discounted subscription rate. Thirty-one bike stations are along transit lines out of the city. At these “V³+” stations, a percentage of the bikes are set aside for registered commuters to keep overnight and bring back the next morning at no extra charge. These transit integrations will be a hallmark of new 4th generation bike-sharing, along with the possibility of advance reservations, RFID integrations with mobile phones allow greater payment capabilities and compatibility across multiple bike-sharing systems. In setting up V³, Bordeaux worked with the transportation company, Keolis. Interestingly, the service’s deployment was held back five months so that the new bus and trams lines would be ready for the bike-share stations! Because the system is run by a transportation company, it is not connected any to city advertising contract, and as reported by Sudouest.Com, the cost to the Communauté was 1,100€ ($1,500 US) per bike. The bike-share only subscriptions are available at 80 stations by credit card for the 1€ ($1.35 US) daily and 5€ ($6.80 US)weekly. The V³ RFID card offers 7€ ($9.50 US)monthly and 25€ ($34 US) annual subscriptions and is available on-line or at any transit system agent. These price levels are in line for creating a large subscriber base. As with most systems, V³ does not charge for the first 30 minutes of usage. However, the next hour and each additional hour is either 2€ or 1€ according to the type of subscription. The hope is that the new integrated system will reduce single occupancy automobile usage, reduce long commuting times, and reduce the waiting time in the evening for opening one of the wine bottles for which this region of France is famous. As reported in The Bike-sharing Blog last summer with "The TIGER Roars in Washington, D.C.", municipalities from across the 5-million resident D.C. region had come together to support a U.S. Department of Transportation "Transportation Investment Generating Economic Recovery" (TIGER) stimulus funding request for $11M for a greatly expanded regional bike-sharing service. (In fact, of the region's transit funding requests, bike-sharing was the 2nd priority, right after bus rapid transit infrastructure improvements.) The funding would have provided for the capital cost of 3,000 bikes in D.C., Maryland, and Virginia. Each participating jurisdiction would have funded the operating cost for their share of the bikes. 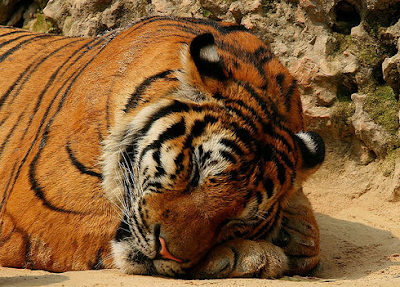 Today, TIGER grant awards were announced and the region's request for bike-sharing was not supported. I'm saddened that the Federal government didn't see the wisdom of supporting what would become the U.S.'s and North America's largest bike-sharing service and all of the health, livability, and environmental benefits the application offered. All is not lost, however. The process of applying for the Federal grant brought together many parties, including elected officials and transport staff, from around the region who had not previously discussed bike-sharing. With much change happening in the D.C. area regarding planned expansion of a bike-sharing service, the right folks from across the region are now sitting around the table to discuss how bike-sharing can best fit into their communities and fund it. This is a minor setback which will require greater creativity to make the region's bike-sharing service the success that it will become. February 16th at 8:00 AM, Mayor Marcelo Ebrard of Mexico City will launch "The System of Individual Transportation," Ecobici, the largest year-round bike-sharing system in North America, with over 1,100 bikes and 82 stations. The Federal District of Mexico City will hold the coveted title of the largest system in the western hemisphere until Montréal wakes up from its winter hibernation in May. Still 1,100 bikes is nothing to snooze at! 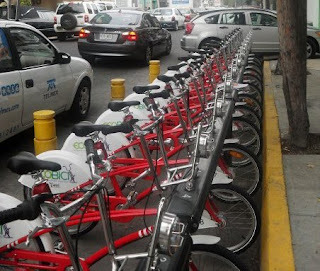 The Bike-sharing Blog first reported the announcement of this program on August 6, 2009: Viva Cuidad de México. In six months this Clear Channel-operated system was planned and installed. The system is starting in four districts of the capital with plans to expand to the rest of the city with a total of 6,000 bikes. According to Cuidadanosenred, Jorge Borobia, director of Clear Channel Mexico, said that depending on the operation of this first stage, it will be analyzed, before extending the service to other areas of the city. As with other Clear Channel SmartBike systems, yearly subscription registration for a system RFID card, shown below, must be bought online or at the Ecobici office. The yearly cost is $300 MXN (about $23 USD). The first 30 minutes of a rental has no charge, the next 30 minutes costs $10 MXN (80¢ US), and after that it costs $35 MXN ($2.70 US) an hour, as reported in merca20. 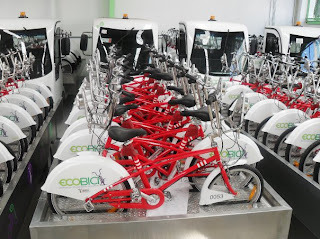 With this pricing, Ecobici hopes to quickly garner 24,000 subscribers. The bikes will be distributed at the “cicloestacionamientos” by small environmentally friendly trucks with trailers. Watch this introductory video (in Spanish). MINNEAPOLIS (Feb. 2, 2010) - Nice Ride Minnesota, a new non-profit created to bring public bike sharing to Minneapolis, today announced that it has chosen Public Bike System Company (PBSC), developer of the Montreal BIXI™ bike-share system, to supply bikes and kiosks to Minneapolis. BIXI launched its 5,000-bike system in Montreal last year to rave reviews. Advanced bike-share systems have been operating in cities like Paris and Barcelona for several years now. The engineers at BIXI learned from the successes in these cities and built a bike share system that is elegant, rugged, and simple to use. Time Magazine recognized BIXI as one of the top inventions of 2008, right behind the Mars Rover. The BIXI system enables an annual subscriber to take a bike from any kiosk with the swipe of a card and return it to any kiosk by simply pushing it into a dock, which locks automatically. The solar-powered system creates accountability: subscribers sign a user agreement online and the system keeps track of who has each bike at all times. The bikes are designed for short trips in the city, such as across downtown for an appointment or a quick trip to a local market, which in turn reduces pollution and congestion. The bikes are designed to be ridden by people wearing regular clothes and include full fenders, lights and a cargo rack. Nice Ride Minnesota’s Phase 1 plan calls for 1,000 bikes in 80 kiosks throughout downtown, the University of Minnesota Twin Cities campus and surrounding commercial districts. Nice Ride expects to have at least 65 of these kiosks in place when it launches Minneapolis’ bike share in June 2010. Minneapolis joins Boston and London in selecting the BIXI equipment as the best for an urban bike-share system. Nice Ride Minnesota expects to finalize a contract with the PBSC very soon. The primary funding sources for this purchase come from a Bike Walk Twin Cities (BWTC) grant and a Blue Cross and Blue Shield of Minnesota (Blue Cross) sponsorship using proceeds from its historic settlement with tobacco companies. BWTC is a federally funded initiative to increase biking and walking and reduce driving in Minneapolis and neighboring communities. A program of Transit for Livable Communities, BWTC allocates funds to local governments for safer crosswalks, bike lanes, and other improvements, and works with organizations, businesses and residents on public education about biking and walking options. Blue Cross’ commitment to promoting prevention and wellness is evident in its anti-smoking campaigns and efforts to fight obesity. The bike-share program will help people to be active and move more making it a strong complement to the Blue Cross do campaign, which encourages everyone to “groove your body every day.” Each bike will display the do message. Nice Ride Minnesota has also received support from a diverse group of businesses. 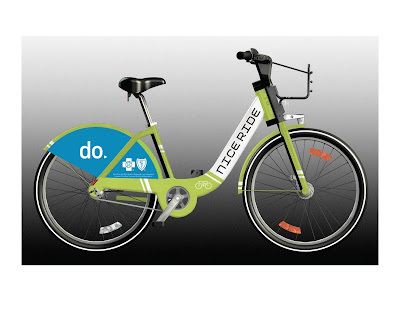 Target, Augsburg College, Grant Thornton, Abbott Northwestern Hospital, Dorsey & Whitney LLP, Seward Co-op, Wedge Co-op, Equal Exchange, Peace Coffee, Birchwood Cafe, DERO Bike Rack Co. and Aveda have all committed to sponsor Nice Ride bike-share kiosks.